Spinsters, I'm not sure if you're aware, but Father's Day is fast approaching. If you're anything like I am, buying gifts for the men is really difficult, owing to the fact that your interaction with any variety of males is extremely limited. Well, and the fact that they're just really hard to buy for. 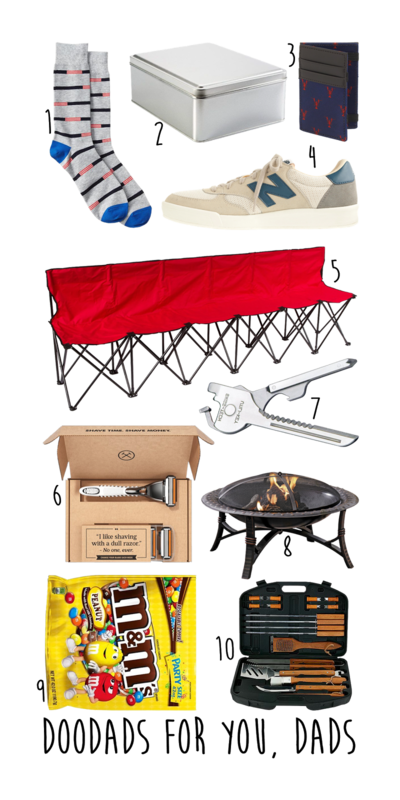 Whenever I run a search for men's gift ideas, they always fall into one of a few categories: Drinking, grilling, fancy skincare/personal grooming, sports fandom, technology, geekery, and outdoorsiness. Well, my dad doesn't really fit into any of those...except perhaps sports fandom, maybe. Unfortunately, my brother and brother-in-law have the sports thing on lock, so I can't steal that. This means either I've got to think a long time and get creative, or my gifts are a little bland. Sigh. Today I've put together a fairly neutral-but-useful list of gifts you can consider for father's day. Some of the categories mentioned above are included, but where I've used those (see numbers six and ten), I've at least tried to choose a really affordable option. However, please note that my dad will not be receiving grilling equipment. I'm pretty sure that's not his thing. Now, let's get to linking. Most people who have received gifts from me know that socks are my go-to. In fact, if you've seen many of my gift guides, you probably already know this. This socks are nice and affordable, but you're probably thinking your budget was a little bigger than $8. I think socks are a great little addition to a gift card so that your father's day isn't quite so..two-dimensional or boring. However, gift cards to his favorite restaurant, to the movies, or pretty much anywhere he can take your mom on a date (unless they're divorced and would never go on a date), would be excellent. If the date thing doesn't work, there's always the driving range, a batting cage, or a fancy shave. I own two of these tins, and I've kept them simple and basic. The gift here, though, isn't really the tin. You can customize the tin by spray-painting a stencil on it or adding his initials, but the actual gift is your filling the container with his favorite treat! This is if your dad is a little fancy or fashionable. This wallet is slim and minimal, so if you're thinking of doing this one, just make sure your dad isn't the kind of guy who carries a large, bulging wallet. If he carries a fat wallet, then good for him, but you probably shouldn't get this little guy. I love these sneakers because they're so basic yet fashionable. This idea is great if you've got a little bit of a bigger budget but have already given way too many silk ties for that to be an option. These are great for when your dad needs to just chill out. When I saw this, I knew I had to put it in a gift guide. If your dad is a sports fan or likes camping or just sitting on the beach, this is a great way for him to either provide seating for a bunch of friends and family OR he can lay down on it and take a little napski. Pretty cool, huh? Technically, the cheapest Dollar Shave Club package is $1 a month, but you still have to pay $2 for shipping, so it's $3 for all intents and purposes. Now, this is a great gift if your dad does not have a beard and needs to change his razor more often. It's also one of those gifts that keeps on giving. I like those. If you get the cheapest one, it'll only cost you $36 for the whole year. This gift isn't just for the handy dad. It's got useful stuff on it to like a cutting tool and some screw drivers. It'll fit nicely on his keyring, so he'll always have it with him when he finds himself in need. This is a great gathering point for anyone's back yard. It's like a more sophisticated, more contained bonfire. If you live in the south, it'll probably be too hot for several months for your dad to use this, but once the fall comes, it'll be lots of fun. If this is a little more than you'd planned to spend, you might consider going in with your siblings. Think how much fun it could be around thanksgiving to roast some marshmallows and make s'mores. This is just a suggestion of what kind of candy you could get. I've noticed my dad likes some peanut m&ms, so giving him a giant bag of them is just one of those useful nd thoughtful gift. Figure out what your dad's favorite candy or treat is, and give him a bunch of it! If your dad actually does like to barbecue, this is a pretty good little starter kit. Make sure he likes to barbecue, though, before you get it because receiving a gift that seems to be a nudge or request is kind of the worst. That'd be like getting your dad a special cart for taking out the trash or something. No good, spinsters. No good. I hope this shopping list has helped a little! I'm aiming for all our dads to have a happy (and maybe even useful) Father's Day!